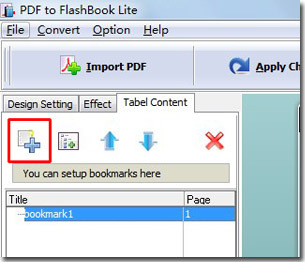 Q: How to make a multi-level bookmark with the flip book maker? The bookmark function brings much convenience to our users. And today I want to know that if it is possible to create a multi-level bookmark when I make a flip book? It means to add child tab for some titles. I can work out a clear structure by this way. 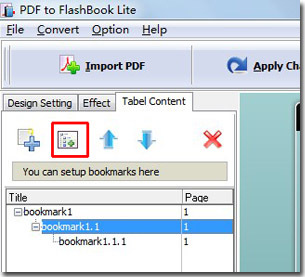 As you know, you can set up bookmark for flip book with the PDF to FlashBook Lite. And today I would like to tell you how to create a multi-level bookmark easily. You can reference to the below tips to get some help. 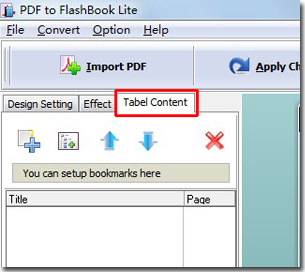 Step1: click Tabel Content tab in the left panel. Step2: click the Add button to add a bookmark at first. Step3: choose the bookmark you have created, click Add Child button to add a child bookmark. You must make sure that you have chosen a parent-bookmark for the child-bookmark. If not, the Add Child button won’t be available.